Solomon Levinson was born in 1867 in Lake County, California. He was the fifth child of Abraham and Henrietta Boukofsky Levinson. Abraham Levinson was born in Zempelburg, Prussia in 1826, and settled in Napa, California, in 1850, where he opened a general merchandise store. Henrietta moved her children to San Francisco, where some of her siblings lived. In 1883, Solomon Levinson found work for Blumenthal & Co., a glove manufacturer. In 1885, he joined the firm of Shoenberg & Co. as a glove cutter. In 1895, he went to work for Pacific Glove Works. During the late 1890’s, a boxer asked Solomon if he could design a boxing glove that would be more comfortable when the boxer opened and closed his fists. Solomon developed a glove that was fully padded and sewn into a slightly curved shape. In 1897, Robert “Ruby” Fitzsimmons fought Jim Corbett for the heavyweight championship. Fitzsimmons insisted on using gloves made by Solomon Levinson because they helped prevent hand injuries. In 1898, a pair of Levinson’s Boxing Gloves made their way to Luzon, in the Philippines, where boxing matches were encouraged by the U.S. Army. In 1904, Solomon Levinson left Blumenthal & Co. and began working for himself as a glove manufacturer. Around this time, Solomon Levinson also bought a saloon, and after a year became a partner in a liquor store. 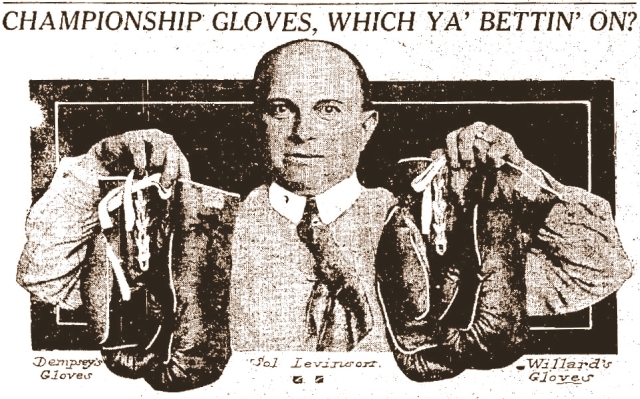 In 1905, Levinson not only made boxing gloves, but also began refereeing matches. He served on the board of the California Amateur Athletics Association. He also managed boxers, including Johnny McCarthy. By 1907, Solomon Levinson had opened his own sporting goods store at 1443 Fillmore Street. He later moved the store to 44 Eddy Street. 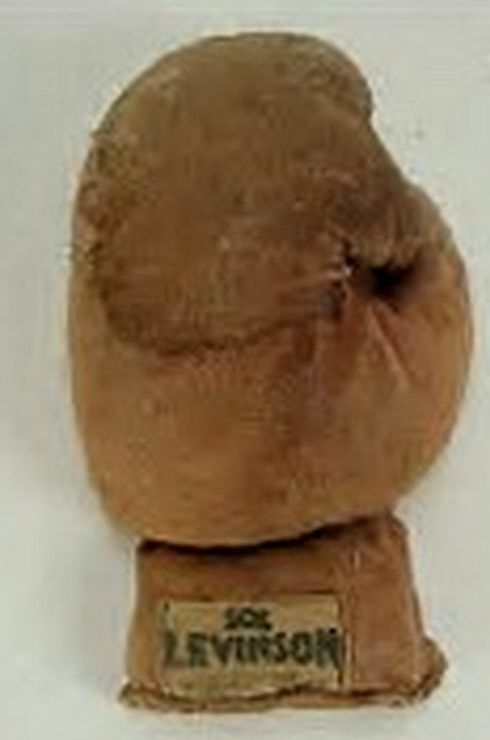 Solomon’s boxing gloves became necessary equipment for world-famous boxers, such as Fitzsimmons and James Jeffries. In 1913, Levinson’s store was moved to 1028 Market Street. In 1918, the U.S. military base at Camp Lewis ordered 100 pairs of Levinson’s Boxing Gloves. In 1895, Solomon Levinson married Maude A. Valentine. They had one son: Aubrey (b. 1896). Solomon and Maude divorced in 1904. He later married Gertrude Farley, but Gertrude died the following year. In 1917, Solomon married Florence Hayes. 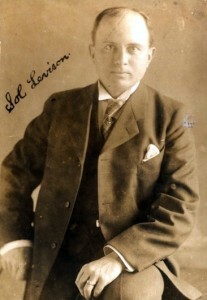 Solomon Levinson died in 1925 in San Francisco, California. He is buried in the Hills of Eternity Cemetery in Colma, California. After Solomon Levinson’s death, his assets were split between his son, Aubrey, and his wife, Florence. Florence moved the store to 1149 ½ Mission Street in 1932. The store closed in 1939. In 1946, Clarence T. Braun & Co. were listed as the sole manufacturers of Solomon Levinson’s Boxing Gloves. Jeremy G.Frankel and Victoria Frisch, “Solomon Levinson: From Kid Gloves to Boxing Gloves, 1867-1925,” Western States Jewish History 47/2. Samantha Silver is curator for this Solomon Levinson exhibit. The San Francisco Jewish community, says Temple Emanu-El, has taken a strong and firm hold of the Roumanian immigration problem. Directed by the energetic president of District No. 4, International Order of B’nai B’rith, Mr. Lucius L. Solomon, a committee of earnest workers, representing every Jewish organization in the city has taken measures for the competent discharge of the community’s duty in this matter. This committee, composed of practical businessmen, will look solely to the issue confronting them, namely, that a great community like ours cannot afford to exhibit indifference when the collective energies of Israel are to be enlisted. At the same time the committee understands the necessity of guarding itself against the operation of indiscriminate sympathy. Nothing inconsistent with good citizenship can be done. The understanding is that skilled labor, and even unskilled, can be easily distributed throughout the Northwest and along the Coast, provided the committee can do its work gradually and without embarrassment by a sudden influx of a larger number than it is possible to handle.